It's literally a worse void walker. Void Walker is also a class card, footman is not. Seriously, everyone playing this guy now. It always trades 2 for 1 because it's such an effective card and you can't get around it because it has taunt. I always need to run 2 tuskstone boars into it while he can swarm the field because he started footman on turn 1. If you compare this to other taunt creatures, he's the only one that gets more than double the cost value in stats (3 stats for 1 cost, while other creatures are 2/2 for 2, 3/3 for 3, 3/5 for 4 or even worse: 1/4 for 3, 3/6 for 5). It's not fair that a 1 drop with taunt can 2 for 1 another 1 drop. It even kills my favourite 3 drop magma rager! I'm not bad, but I'm stuck at rank 20 because everyone runs this card! 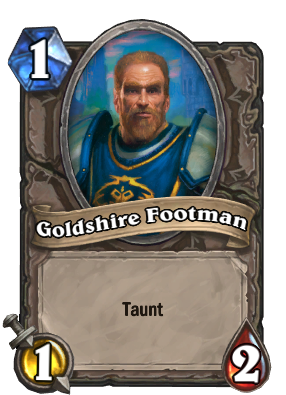 Taunt minions usually take a stat hit, Footmen do not, so it's a bit over budget it's not a bad card...But when you have more advanced decks, footmen are less important. Really loved this guy when I just started HS. Same here. I would put one in all my decks. Now its unused lol.